The Groomers Emergency Assistance Fund Needs Your Help! Imagine that you have been in the boarding kennel and grooming business for over 16 years. You have three groomers, three kennel techs, and one bather depending on your business for their livelihood. On August 25, 2017 Hurricane Harvey would come ashore and life as you know it would be changed forever. 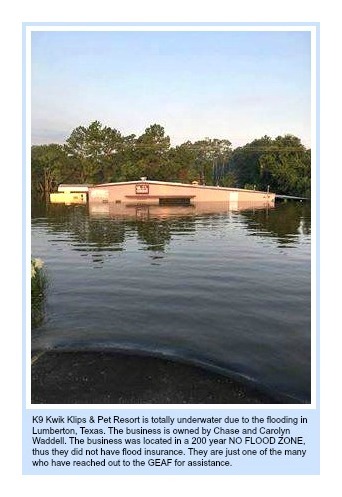 Your hometown of Lumberton, Texas, is now completely underwater. This is a real scenario for many groomers who – like 80% of Texans – did not have flood insurance and have lost absolutely everything. The people in this story are real and they are currently unemployed after the destruction of Hurricane Harvey. That’s just one grooming-related family affected by this hurricane. There are hundreds more experiencing very similar situations. Currently, a second hurricane is bearing down on the United States. Experts say it is still too early to determine exactly where and how strong Hurricane Irma will be. It is projected to be a Category 5 hurricane as it hits Puerto Rico, which is directly in Irma’s path. With any tragedy comes the need for people to reach out and help others. Finding the right avenue(s) to contribute can be daunting. Unfortunately, there will be those who take unfair advantage of the situation. It is for this reason the Groomers Emergency Assistance Fund (GEAF) was formed. The GEAF is an IRS registered non-profit 501c (3) Corporation. The GEAF grew from the turmoil caused by superstorm Sandy. Local groomers that were unaffected by the tragedy helped those who were less fortunate. Groomers and industry-related companies across the country contributed what they could. They helped both financially and with equipment donations. Donors were confident that their efforts would go directly into the hands of a groomer. The GEAF had a direct impact on getting those affected by Hurricane Sandy up and running again. 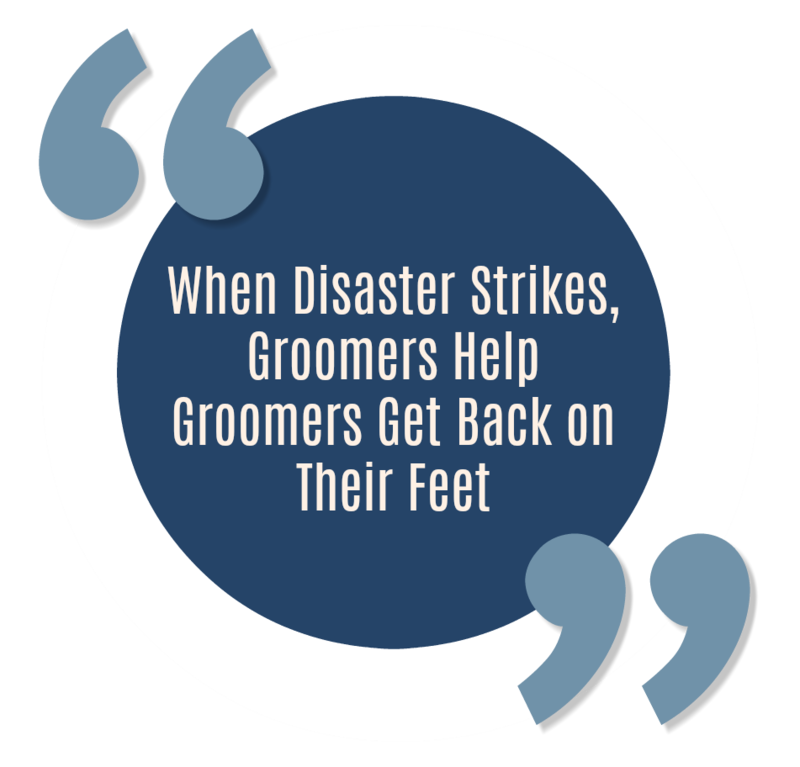 The goal of the GEAF is to help relieve the immediate needs of groomers in distress. These are groomers who may have lost their businesses, equipment, or even their homes in the path of tragedy. GEAF helps groomers in need within the continental United States plus Alaska, Hawaii, and Puerto Rico. Applicants are vetted to ensure they will qualify for aid. Insurance policies are reviewed and volunteers help the applicants get the most out of their policies. They are walked through FEMA applications by professional volunteers. We need your help to make their efforts go even further! If every groomer and salon owner reading this would donate the price of just one groom a day or even a week, imagine the impact it would have! GEAF could help scores of pet professionals. Remember, every little bit helps. You can help a grooming family in need. Your support is crucial to help groomers in the path of these recent natural disasters. If you’re able, we’d love it if you could donate even $5.00. The greater your generosity, the larger the impact GEAF can make. All donations are tax-deductible under the 501c (3) Corporation classification. Thank you in advance for your contribution. Your donation will go toward putting food on tables, roofs over heads, and groomers back to work. Make a public donation here. Make a private donation via GEAF’s PayPal account. The GEAF wants to help every affected groomer keep a roof over their heads, food on their tables and grooming tools in their hands. Every dime you contribute goes directly to help a sister or brother pet stylist. Every piece of equipment goes directly to someone who really needs it. At the time this blog was published, over $9,000 has been donated to help those in need. Are you able to help? P.S. You can learn more about the Groomers Emergency Assistance Fund at www.geaf2013.org or their Facebook page. They can do more than just offer financial assistance when emergencies hit our fellow grooming brothers and sisters!